I cannot tell you how much I suffered with symphysis pubis dysfunction during my first pregnancy. I can remember a breaking point where I got back from an evening run and my husband looked at me with concern in his eyes and said, "how long are you going to do this?". I would get out of the shower after a run and could barely walk due to the pain in the front of my pelvis. I was on a mission to stay as fit as possible and minimize excessive weight gain. I was actually petrified of this! I hated the body changes I was going through, even though I knew something miraculous was going on...it was still the first time I truly felt out of control with my weight. I continued to attend the gym and did a lot of functional training with heavy weights and running. On top of this, I also did a lot exercises that you're not supposed to do during pregnancy. This list included: jumping, lifting heavy, lunges (and a lot of other asymmetrical movements), excessive core movements (because your core is compromised during pregnancy, it is important to stay away from this). I'm just being honest here because if there is one thing I understand, it is wanting to continue doing the workouts that you "normally do". At 19 weeks, I went on a 9 mile run, experienced a lot of pubic bone pain and figured it would go away. It never did. It got worse as time continued on. The pain became so bad, I was worried about being able to perform at my job! My job as a physical therapist is physically demanding. For certain treatments, I have to put one leg up on the table while the other leg is down and I could NOT do this. Fast forward to my pregnancy with my second baby Avery. I started to get the pubic bone pain even EARLIER! It started at 15 weeks with Avery. At the time, we were in the process of creating Expecting and Empowered Pregnancy Workout Guide. I was able to do the workouts we had written starting at 20 weeks and the pain was GONE by 25 weeks. With this third pregnancy, I HAVEN'T had any pubic symphysis pain at all! The difference is that I did/am doing exercises appropriate for pregnancy and I learned to listen to my body. The pubic symphysis is located at the front of the pelvis where the two sides of the pelvis meet. This typically is a fairly stable joint, but that changes during pregnancy due to hormonal changes. The ligaments relax and allow for increased movement, which can result in misalignment and PAIN. Pubic Symphysis Dysfunction is thought to affect up to 1 in 4 women during pregnancy. It can range in severity from mild to discomfort during daily activities to inability to bear weight on the legs. That little joint at the bottom, can cause SO much pain! 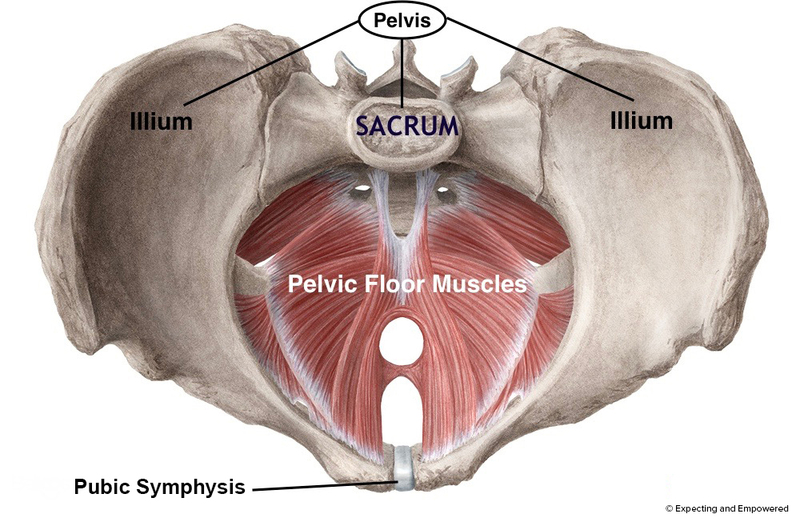 The main symptom of Pubic Symphysis Dysfunction is pain at the front of the pelvic girdle. However, many women also complain of lower back pain, leg pain, or lower abdominal pain. Women who are experiencing pain may also walk with a waddling gait and have pain with walking, lifting, carrying objects, rolling in bed, climbing stairs, getting in and out of the car, and standing. Any activity that requires asymmetrical movement of the legs is likely to cause pain due to shearing forces (being pulled in opposite directions) at the pubic symphysis. The RIGHT Strength Training. Here is the thing: pregnancy is a time of INSTABILITY so STABILITY is key. Stability can be accomplished through proper strength training. It took me 5 weeks to get better cause that is how long it takes for strength to actually take effect. I cannot recommend utilizing Expecting and Empowered Pregnancy Fitness Guide enough, it has been such a difference maker for me. The reason that Expecting and Empowered worked to treat my pain and prevent it in my 3rd pregnancy was the TYPE and SEQUENCE of exercises I do using. Visiting a Physical Therapist or Chiropractor to Assist. To be clear: it can NOT be fixed long term with either of those options. Unfortunately, this is one of those injuries that as a provider I can help make better for only a day or two. Ice, Ice Baby. Anti-inflammatory medication is not recommended during pregnancy, but applying ice to the pubic symphysis regularly may help with pain and inflammation, and heating surrounding musculature may decrease muscle spasm and tightness to decrease pain. Other treatment options: soft tissue mobilization/massage, strengthening exercises, postural exercises, and education on body mechanics and strategies to minimize pain with activities of daily living. Do not sleep with one leg up and one leg down. If you sleep on your side, keep both knees together. There are exercises than can REALLY help! We want to help EVERYONE do it! That is why we created a freebie with workouts that you NEED to be doing if you are experiencing this pain. Sign up for our email list and we'll send it right over. Pubic Symphysis Dysfunction & Freebie Exercises that'll Help!